The new challenge at Overlooked is collections, and here's my childhood collection of smurfs.... it's a dangerous thing getting them out... I'm very tempted to have a peek on ebay for new ones! The journalling prompts on Overlooked are great, really get you thinking and i'm including my notes below.... in time for a project later in the month. 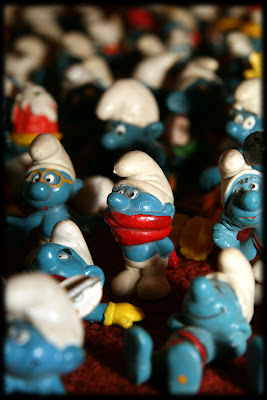 As a child the search for smurfs was a serious business! I remember one occasion as a child finding a big basket of smurfs in a local newsagents and remember how important it was to me to have each design! I spent all my pocket money savings and then begged Mum to get me the rest! My favourite was Cecil! The little guy with the red scarf over his mouth! I'm not sure why I gave him that name but it certainly suits him! 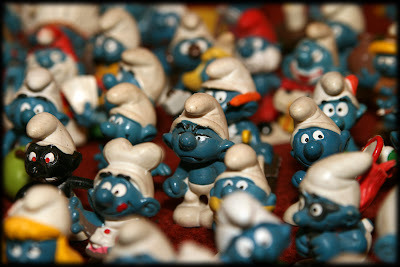 As a child we used to take family camping holidays, and the whole set of smurfs had to come too! I remember we had an old camper van and sitting in the back with the table between the bench seats, I used to hold a mini tournament with the smurfs. All the smurfs were stood up(quite a feat in itself - there was always the risk of them going down like a series of dominoes) and as the van moved on the road and around corners each smurfs' footing was gradually distubed. The last one standing (literally) was the winner! I've not looked at my collection for many years, but I'm rather attached still. I'm notoriously unsentimental and have shed most of my childhood trappings, but i think i'd find it very hard to get rid of them. The smurfs were never really displayed although I played with them often, but they were usually stored in their red basket - ready to go wherever they were needed. Now they live in the same basket - but I often think about giving them a place to be displayed! This makes me smile everytime I read it. I can't wait to see your page on this - journaling is a must!! Cute! I only had a few of the little guys myself. An smurfette of course. The Smurfs game fo Colecovision rocks - I'm still trying to find a controller that works so I can play it.